What is Netbus and what does it do? 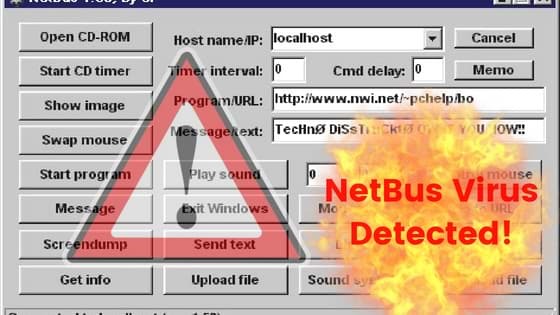 Netbus, misunderstood as a virus was primarily designed to control a user’s PC remotely with an intention to help fix their issues on Windows based OS. Netbus was the masterpiece of a Swedish programmer, Carl-Fredrik Neikter, written in the year 1998. It is being recognized as Trojan by general audience is completely understood, as it provides access to several features remotely which is now been used as a backdoor for other malware. Netbus has been completely redesigned by various organization to carry forward their malicious activities. After its redesign Netbus has turned out to be one of the most harmful and readily available trojan. It clearly means, you won’t wind up with Netbus being installed on your system unless you have executed its file. Also See: Is Gstatic a virus? Just a trick away before Netbus gets hold of your system! To trick a user into installing Netbus the developers commonly disguise it as an authentic application, in any case the file will never come out saying that it is Netbus. Another major component of Netbus is “Command and Control Centre,” controlled by the hackers it provides complete control of the user’s system. A dedicated graphical interface is provided at the user’s end, a screen with few buttons. This program also has the facility to scan “Class C” addresses by adding “+desired port” at the end of the targeted address. Example: 255.255.255.1+254 will now scan as 255.255.255.1 passing through the desired port 255. Netbus hides itself among the system files of the compromised PC, often taking a name like “Msconfig.exe,” or “Patch.exe” in order to make itself look like a genuine system file. Netbus also possess the ability to prevent a user from accessing or deleting its files. Hiding among the system files, Netbus becomes indistinguishable on the infected computer, and it also runs automatically when the system boots-up. A regular PC user will not recognize these symptoms. However, a more experienced technical person can check for any of the Netbus activity on ports 12346 and 12345, one of which are frequently used by Netbus. Netbus must be eliminated immediately, as the hackers can use it to steal your credentials. Netbus can ruin life’s, it has been used that way before and we never know what’s to come next. Best proven method to prevent any such infections from striking down your system is by enabling a robust firewall against it. We can only recommend you to download free malware removal tool and be done with your part. Anti-malware programs are known to block all sorts of virus and other malicious programs. Anti-malware programs will not only block viruses like any other anti-virus application, but also block any malware like spyware, trojan, ransomware, adware, and many more – that strikes your firewall. Previous Post:How To Delete Ramnit Trojan Completely?